Bebo Norman's fifth studio album Try releases two years after his last acclaimed effort Myself When I Am Real. Norman's sound has evolved nicely from his signature stripped-down folk pop to catchy pop/rock, never once losing the transparent, open, and honest approach Norman has become known for. Norman has always stood out from the rest with his textured folk backdrops accompanying his deep, intimate vocals and genuine lyrical poetry. Lyrically, Norman has become popular for his openness to write about the loneliness he struggles with and fear of forever remaining alone. His ability to wear his heart on his sleeve makes his music inviting. But while Bebo has solidified himself as bachelor's-best-friend, a recent marriage and renewed outlook on life has turned his newest release Try into a whole new affair. The themes on Try range from straight-up heartfelt worship to expressions of love and happiness, a far cry from the fragility expressed on Myself When I Am Real. So is this new side of Bebo a bad thing? Of course not, but his music does lose that beautiful edge that made some of his best songs that much better. The title track, however, shows Norman addressing his bittersweet feelings about getting older and growing up. The sound is more pop while being more folk this time around but all the while never losing the sensitivity that makes Bebo Norman such a joy to listen to. In the past, Bebo's songs like "Great Light Of The World" have proven he's a fine worship songwriter. "Nothing Without You," featured in two different recordings on Try, and "Disappear" are humbling worship songs, offering a fresh and more intricate approach to the praise and worship genre than most other songs available. "The Other Side Of Day" is another album highlight, a song about looking to our future in Heaven, while "Standing In Your Silence" expresses Norman's thoughts on falling in love. "Drifting" is a real emotional gem in the same vein as "So Afraid" and "Break Me Through" as Norman writes once again about his experiences with loneliness, however this time meditating further on the love and peace that comes when God lifts us out of it. "Yes I Will" is a simple acoustic love song to Jesus written following a screening of The Passion Of The Christ that reaffirms Bebo's heart to follow Him. 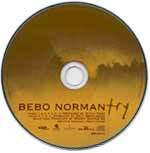 Try succeeds on many levels as Bebo Norman continues to write relevant and meaningful songs for listeners to associate with and worship along to. While maybe not as powerful in some respects as Myself..., Try marks a new chapter in the life of an incredible artist and musician, and like in any good book, continues to carry the listener along Bebo Norman's life story quite nicely.